Don't shy away from bright shades! 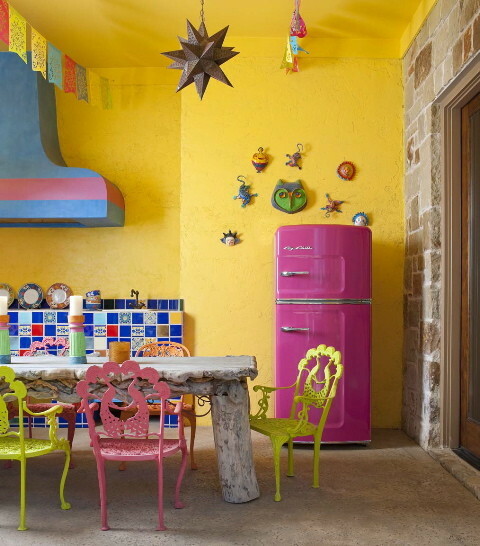 This home decor is both colorful and chic. Organize your shelves by hue. Solid bright throw pillows on a white couch are a nice touch as well. Eclectic Living Homes outlines several inexpensive ways to color block. For instance, backing frames with colorful construction paper is a simple but striking way to add a touch of brightness. One striking piece of wall decor can be all you need to color up a room. Coordinate room decor around its hues, but keep it simple, as in this image by Marili Forastieri. Follow this example from Tobi Fairley Interior Designs; pick your favorite three colors and stick with those. Cool abstract artwork and a funky carpet pull it all together. Combine a bright and a neutral hue for eye-catching contrast. Funky Bear Decor has gathered several examples of the unusual combination of gray and yellow. Individually colored kitchen cabinets in an otherwise pristine interior are both playful and minimalist. The Tao of Dana has several tips for beginner color enthusiasts. Living Design Home shows the effectiveness of focusing on a particular palette. Shades of blue and green keep your color scheme calming. Paper lanterns and patterned pillows create an oriental vibe. Check out several other bright and cheery living rooms on Naura Home Design. 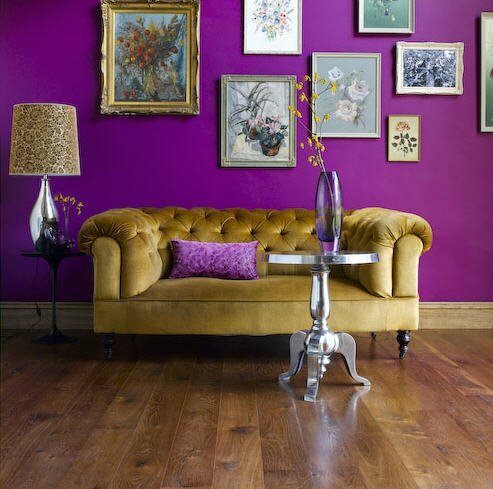 Yes, you can focus on a single hue without going overboard, as evidenced by the collection of amazing purple rooms from Curbly. Purple walls, a pillow, and a vase are just enough, and go well with more muted artwork. Let your colorful bathroom accessories take center stage against a white backdrop. Stripes and florals can go together if you stick to similar shades. 79 Ideas shows you how to liven up a white room with textiles. This awesome, abstract rug-- like this one by Sonya Winner-- is all the color you need. Wooden cabinets and muted tones help offset the bright orange wall in this room, but the funky cow painting brings it all together. Don't forget your office space. Bright walls, lamps, and notebooks will keep you from snoozing off at your desk. Combine a vintage-inspired pink refrigerator, colorful tiles, and bright chairs for an old-school but upbeat design, as in this kitchen by Astleford Interiors.